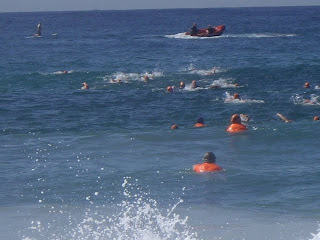 Starting sighting drills at the beach - swimming out and around buoys. Such exhausting work - getting out and through the surf, around the buoys and back through the channel (like swimming on a treadmill) before running up the beach! 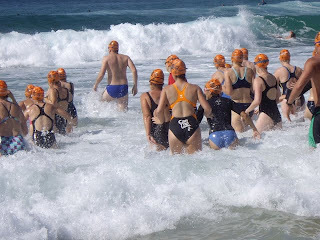 Swimming such a short distance has never been so exhausted! Afterwards they told us that if the surf ever got that big in the Cole Classic or the Big Swim they'd cancel - this is a relief. We have to swim in that? !